Worldwide Electric Cast Iron Worm Gear Reducers Mounting Base Ensures Stability For Worm Gear Reducers. 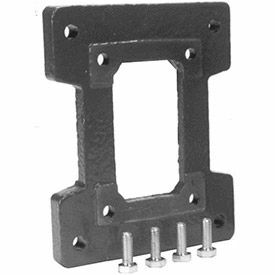 Worldwide Electric Cast Iron Worm Gear Reducers Mounting Bases are available in sizes ranging from 1.33 to 3.25 center distance. Mounting bolts are included. Worldwide Electric Aluminum Worm Gear Reducer Accessories Available For Motor And Power Transmission Applications. Worldwide Electric Aluminum Worm Gear Reducer Accessories include Double Output Shaft, Output Cover, Output Flange, Single Output Shaft, and Torque Arm for CALM series. Shaft Mount Reducer Accessory, Motor Mount And Belt Guard Are Designed For Heavy Industrial Use. Motor Mounts are constructed from heavy gauge steel for long lasting durability. Belt Guards feature a slotted metal panel with hinge for easy access to belts and sheaves. 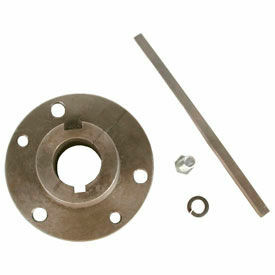 Motor Mounts and Belt Guards are for use in combination with shaft mount reducers. Dimensions very per model. 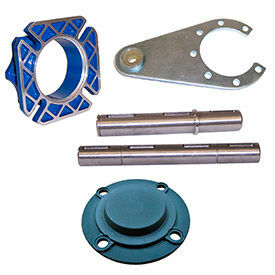 Shaft Mount Reducer Accessory, Bushing Kits Are Interchangeable With Other Manufacturer's Units. 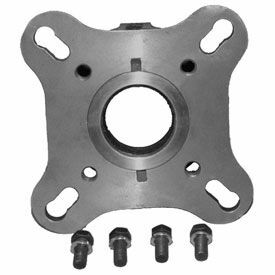 Shaft Mount Reducer Accessory, Bushing Kits feature a tapered support on both sides of the reducer for long lasting durability. Tapered bushing kits include fastening bolts and a full length shaft key. 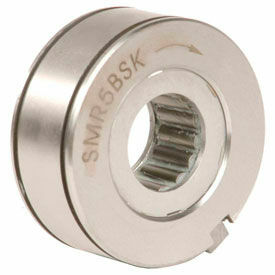 Bore sizes from 1-1/4" to 5-7/16". Shaft Mount Reducer Accessories, Backstop Assembly, Torque Arm And Rebuild Kits Are Designed For Use With WorldWide Electric Reducers. Shaft Mount Reducer Backstop Assembly, Torque Arm and Rebuild Kits are built with high-strength materials for long lasting durability and performance. Backstop Assemblies offer smooth forward operation of conveyor without back slip. Easy installation provides quick replacement and less down time. Torque Arms feature machine precision ground interlocking parts for easy, accurate tensioning and tightening. Rebuild Kits include high speed input shaft, first gear reduction, input bearings, input seal and output seal for precise compatibility with specific shaft mount reducer. Specifications vary per model. Shaft Mount Reducer Screw Conveyor Flanges And Shafts Are Widely Used By Maintenance Staff To Repair Or Maintain WorldWide Electric Reducers. Shaft Mount Reducer Screw Conveyor Flanges And shafts are machined from high tensile strength alloy steel or cast iron for long lasting durability. Screw Conveyor Shaft includes a three-hole design for easy installation. 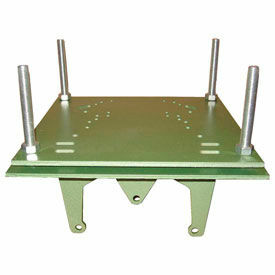 Screw Conveyor Flange features a bolt-on design for quick mounting. All styles conform to CEMA standards. Primary unit compatibility varies by model.